As a resident of Kolkata, I understand better the problem of Electricity Bill Payment at Kolkata. CESC online bill payment is one of best and convenient solution for people but very few people know how to Pay CESC bill Online at Kolkata. If you live in Calcutta then you must know that how people pay their Electricity Bill, usually they pay their Electricity Bill in two ways. Either they pay their Electricity Bill by going CESC office counters and waiting till hours in line or they pay their bill to local agent and the agents submits their Electricity bill to CESC office and get commission from people 5 to 10 rupees on each bill. But from few years technology has changed the tradition and Internet has made the task of Electricity Bill Payment very easy. Now you can easily pay your CESC bill Online via the CESC official website using internet banking, debit card or credit card. 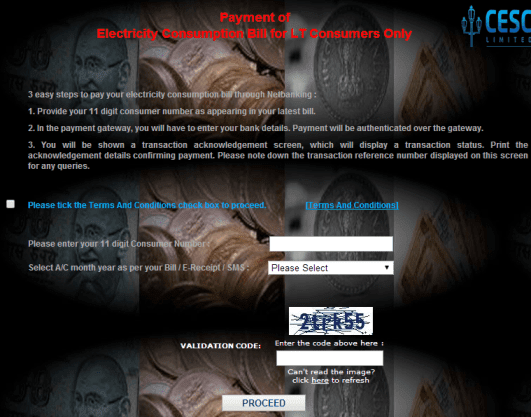 If you are still unknown from the news of CESC Online Bill Payment then you need to know that Calcutta Electricity Supply Corporation (CESC) has already provided the online bill payment privilege for their customers. Note: CESC Bill Payment Online is also known as e-Payment of CESC Bill, so please don't confuse while searching on web. Step (1): At first, go to the Official Website of CESC by following this link Pay CESC Bill Online at Kolkata. Step (2): Now a page will appear as shown below. Here you have to click on Pay Bill Online option. Step (3): After clicking, the online payment page will be opened as shown below. From here you have to click on which type of bill (Monthly Bills, New Connection or Extension of Load Charge, Online Name Transfer, Online AC Application) you want to pay and through which you want to pay (Credit Card, Debit Card or Net Banking). For example: if you want to pay for your Monthly Bills through internet banking then click on Net Banking option below monthly Bills. or If you want to pay with your Credit or Debit Card then click on any of these two according to your need. 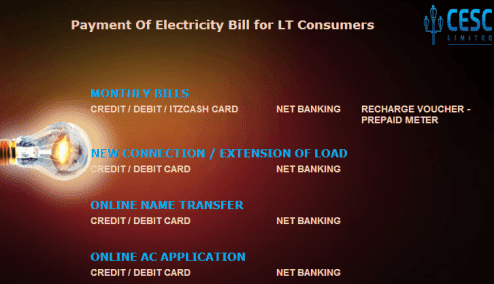 Step (4): When you will click on Net Banking option under the Monthly Bills section then a new window will opened titled as Payment of Electricity Consumption Bills for LT Consumers Only. You have to tick mark the Terms and Conditions to confirm. 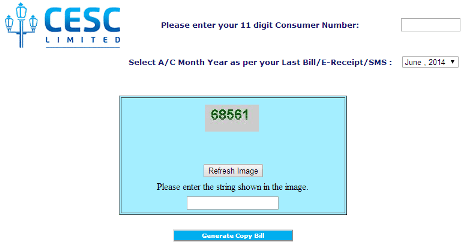 Now, fill up your 11 digit consumer number and select the month for which you want to pay. After that enter the Validation Code correctly and then click on Proceed button. Step (5): After clicking on Proceed button you will be redirected to the payment gateway page. Here you have to fill your Bank account detail as required and follow the instructions to proceed for transaction. Step (6): When transaction is completed, the transaction acknowledgement screen will be display. 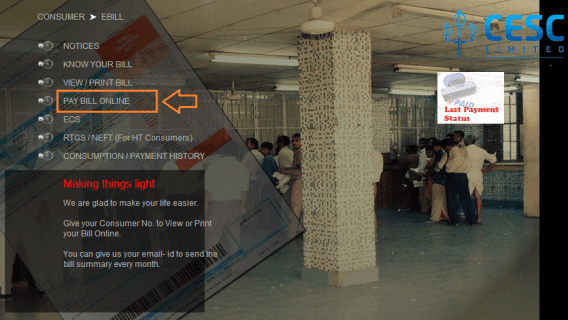 You need to print this page for the confirmation of Online Bill Payment. Also keep a record and reference number provided on this page for your future use. And if you are paying with credit card or debit card then fill up card details carefully then proceed as instructions described above. Step (7): You can also download a copy of your electricity bill. To Generate, you need to enter your 11 digit consumer number then select the month of bill payment. After entering the verification code shown in image then finally click on generate copy bill button. Thus, you can easily pay your CESC Bill online! Feel free to ask me, if you face any problem in order to CESC Online Bill Payment. I will feel so much happy to help you.